The Cinncinnati Bengals have placed veteran cornerback Adam Jones on season-ending injured reserve, according to Jim Owczarski of the Cinncinnati Enquirer. Jones injured his groin during his team’s Week 13 loss to the Pittsburgh Steelers. Jones signed with the Bengals prior to the 2010 season and he has been one of the most consistent cornerbacks in the game ever since. Since 2010, he has cumulatively allowed a passer rating of just 78.5 and an average of 0.95 yards per coverage snap, which ranks 22ns and eighth among 137 cornerbacks with 1000-plus coverage snaps in that span, respectively. This season, Jones has been his same, effective self in coverage. Through 13 weeks, he’s allowed just 15 receptions from 30 targets and has tallied one interception and four pass breakups, surrendering a passer rating of just 60.7 and an average of 0.81 yards per cover snap, which ranks 10th and 13th among 117 qualifying players at the position, respectively. 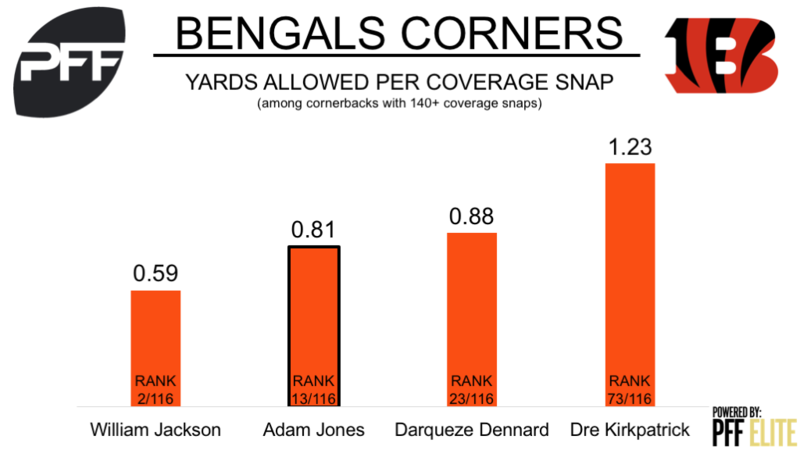 However, in 12 games, Jones has played just 45.9 percent of his team’s defensive snaps, which trails teammates Dre Kirkpatrick (84.6 percent), William Jackson (55.0 percent) and Darqueze Dennard (78.3 percent). With the aforementioned corners all performing well this year and with a 34-year-old Jones about to count $6.7 million against the team’s salary cap, it could possibly be the last time we see Jones in a Bengals uniform.